Westmoreland neighbors along S.E. Knapp Street were disturbed when they discovered flames leaping from a burning car just east of S.E. Milwaukie Avenue on Tuesday, August 7, at about 2:00 a.m. The fire burned so hot, it melted off an electrical service line above, causing it to drop onto the vehicle parked just east of blazing Honda CR-Z, which had been parked at the curb in front of "Sellwood Grooming". "Apparently an unknown person or persons tossed a lit cigarette or other burning object into the garbage roll-cart we had pulled to the curb of our grooming business, and that lit my car on fire," said the shop's co-owner Shawn Osmer, as he looked at the burnt out shell that remained of his car. 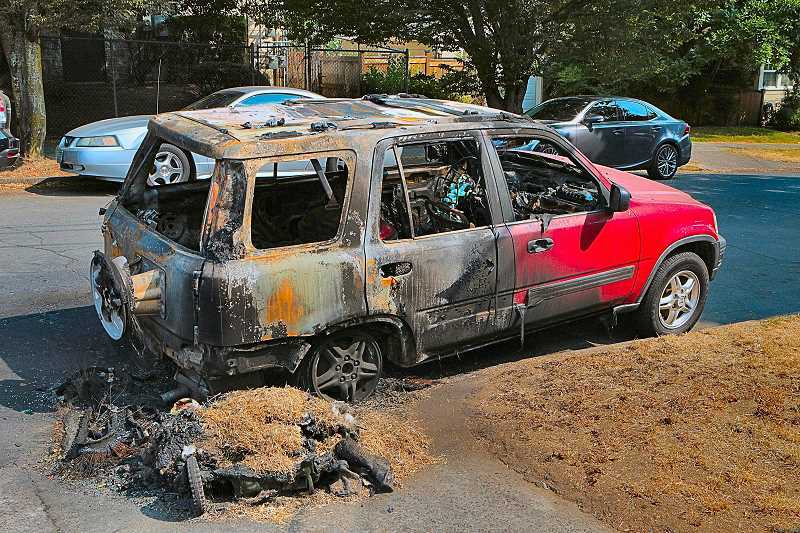 A neighbor reported two vehicles ablaze, but the other car apparently suffered only electrical arc burns to its side mirror from the fallen wire, and had been driven off sometime after the fire. "My car had brand-new brakes, brand-new tires, a new battery, and we've been taking it camping; I'd just cleaned and fueled it before we left it here overnight," Osmer sighed. Although he said the loss of his car was difficult to accept, Osmer said he didn't think it was set fire maliciously.